AudioLab .NET is a set of .NET 2.0-4.5 components for fast audio processing. AudioLab supports Wave Win32 API, Audio ACM, and the latest DirectX Media Objects (DMO), DirectShow, ASIO, VST 2.X and 3.0, and even allows if needed any mixture of them. The developer can choose to go with any of them, to use all, or can switch from the one to the other at any moment. The components hide the complexity of both approaches, and make them look almost identical from the user's perspective. - Recording - records in Wave, WMA(ASF), Ogg, and other formats (DirectShow, WaveAPI, Ogg, Windows Media Encoder, and FFMpeg). - Playback - plays Wave, WMA(ASF), Ogg, and other file formats (DirectShow, WaveAPI, Ogg, Windows Media Encoder, and FFMpeg). - Broadcast - broadcasts audio over IP using Windows Media Encoder. - Receiver - receives remote audio over IP using Windows Media Encoder. - Generators - generate Wave, Triangle, Rectangle, ChainSaw, Random Gauss and custom audio. - Processing - audio filters, amplifiers, equalizers and converters, including custom user defined filters(DirectShow, DMO, VST2/3, and native). - Mixer - Mixes audio signals. - Switches - control enable and disable the audio flow. - VU, PPM and RMS Meters - Volume Unit, Peak Programme Meter, and Root Mean Square meters. - Audio Compression components - compress and decompress audio streams(DirectShow, ACM, and native Vorbis and Speex). - Spectrum - performs real time FFT(Fast Fourier) of the audio, and represents it as spectrum. 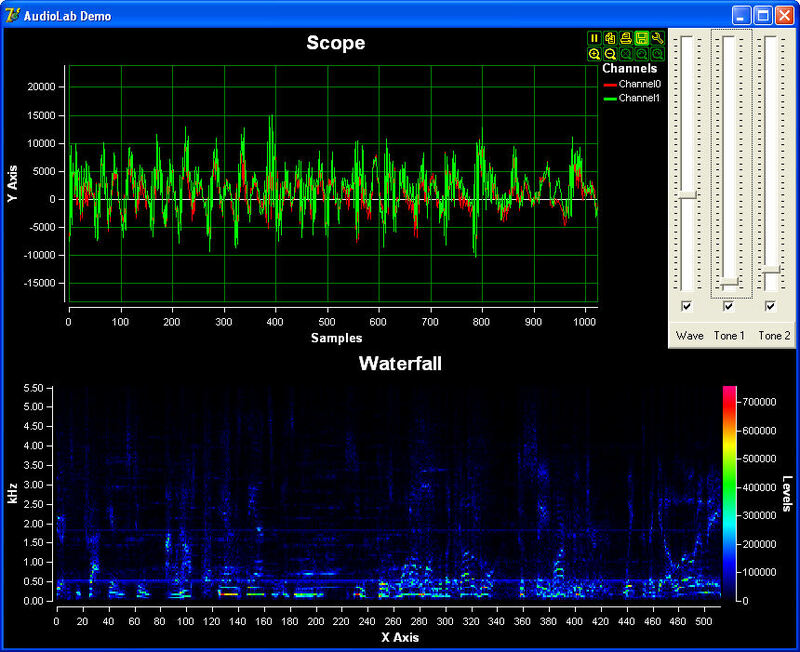 - Scope and Waterfall - display wave and spectrum data.